Today's IT investments require bottom-line, quantifiable truths. Unified communications (UC) is no exception. Moving to UC means not only determining which solution best fits your organizations needs - but means creating a solid business case that demonstrates a strong return on investment (ROI) and a low total cost of ownership (TCO). 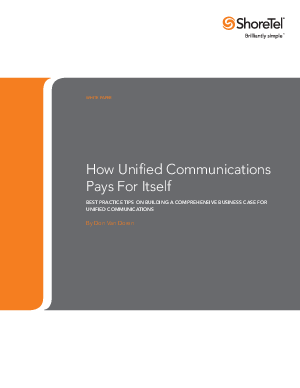 This white paper tells you how to understand the benefits of UC in your organization, identify the preferred modes and means of communications, and then use that criterion as a guide to seek out the best UC solution. Most organizations find that UC enhances user productivity or business processes - or both. UC for user productivity (UC-U) concentrates on helping individual users better manage their communications. These UC capabilities include as presence status, click-to-communicate, instant messaging, and rapid set up of audio, video and Web conferences. UC for business processes (UC-B) focuses on integrating communications capabilities within workflows and processes in order to enhance business activities. Many organizations begin by focusing on using UC to enhance user productivity, but they soon find that both productivity and business processes can be improved by UC. To achieve breakthrough results, it's important to think about communications in a new way. Unified communications is not so much a system as it is a way of thinking about the impact of the next generation of communications capabilities on businesses large and small. This white paper helps you change your thinking.